You’ll be spending a lot of time with your cards, so make sure you really want a close, personal relationship with your chosen deck. If the deck leaves you cold, your readings will be flat and uninspired. Do you love to handle the cards? Do you enjoy lingering over the images and running your eyes over the details? 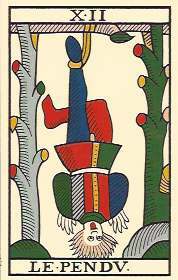 When you lay a few cards on the table, can you feel energy running between the cards, and between the cards and yourself? Let’s look at some historical decks that are readily available and reasonably priced. First we’ll run through historic types, then look at three methods of reproducing the cards. A gold leaf luxury deck commissioned by the Duke of Milan in 1450 and hand painted in a late-medieval style. The Tower, Devil, Knight of Coins and 3 of Swords were lost from the original deck, so all publishers commission an artist to make replacement cards, with varying degrees of historical accuracy. The Classic TdM emerged in mid-1600s France. This is the standard reading deck in Europe, so there’s a great stylistic range, from authentic reproductions to fluorescent re-coloring. 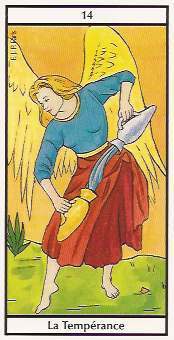 This deck is used to illustrate most European how-to-read-tarot books. 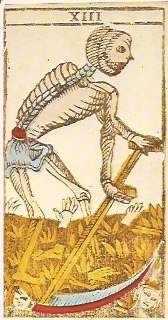 Milan’s distinctive tarot style culminated in Carlo Della Rocca’s engraved Soprafino deck of 1835. Lo Scarabeo and Il Meneghello do several versions of the deck. First produced in 1810 by Gumppenberg of Milan in the elegant classical revival style of the Napoleonic era. 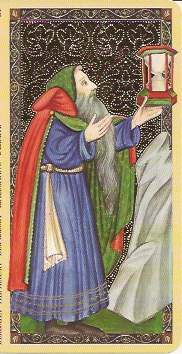 Lo Scarabeo’s Ancient Tarot of Lombardy is the most accessible version. The Church pressured certain card makers to replace the Pope and Papesse with more secular figures. 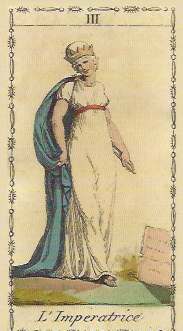 The Roman deities Jupiter and Juno were popular substitutions. The Swiss 1JJ launched U.S. Games, Inc into the tarot business. You have a choice of three methods of reproducing historic decks. The one you prefer depends on your taste and how historically accurate you want your deck to be. These cards are printed from photographs of a deck in a museum, so you see the deck as it exists now, with creases, chipped paint and mildew. Faded lines, off-kilter stenciling and soft colors give these decks a charming folk art feel. It’s what you’d see if you discovered an ancient used deck in your grandmother’s attic. U.S. Games and many Italian publishers do photo reproductions of the Visconti-Sforza deck. Gold leaf has fallen off in spots showing the red backing, paint has chipped off the edges, and all cards have a hole at the top where they were strung on a cord or tacked to a wall. The Lovers card is in the worst shape. Old TdMs often have mildew spots, broken lines due to worn wood blocks, and stenciling that doesn’t always match the lines. 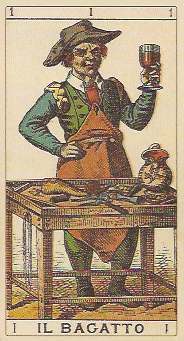 This Tarot de Marseille, originally published by Zoni of Bologna in 1780, is an example of a typical tarot deck for game playing. It was published by Lo Scarabeo in 2000. The 1760 Conver deck is the daddy of all subsequent TdMs. Heron publishes a photo reproduction of this type which is currently housed in the Bibliotheque Nationale in Paris. 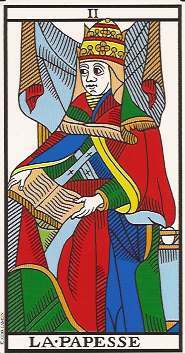 The Soprafino deck was originally printed in the 1800s from engravings by Carlo Della Rocca. Lo Scarabeo and Il Meneghello do reproductions of several versions. These modern re-creations are faithful to the original deck. Dirt and damage are cleaned up, lines are sharpened and colors brightened, making the cards look like new. 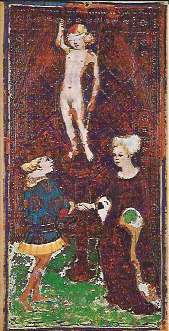 Lo Scarabeo is the only publisher to clean up the Visconti-Sforza deck. They also do a striking gold foil version. Jean-Claude Flornoy has meticulously re-created two very early TdM’s, the 1650 Noblet and the 1701 Dodal using traditional wood blocks and hand stenciling techniques. Philippe Camoin, a direct descendant of Conver, carved new wood blocks to sharpen the image and colors of his ancestor’s original. He’s added details that cause some people to say his deck is actually a modern re-interpretation. Lo Scarabeo does a mini and full-size version of Claude Burdel’s 1751 Swiss deck. These decks are modern re-designs with updated colors and some alterations to the images. Paul Marteau bought Grimaud publishers in the early 20th century and re-colored the Conver TdM to align with his personal symbolism. This is the standard reading deck in France. Le Nouveau Tarot de Marseille by France Jeux Production is an updated TdM with more animated and contemporary figures. The colors are heavy on the orange and yellow. 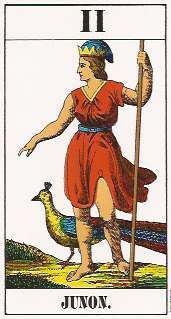 The images in Le Tarot de Marseille published by Fournier have brighter, more contemporary colors. Fournier is a major deck publisher that does several versions of updated TdMs. 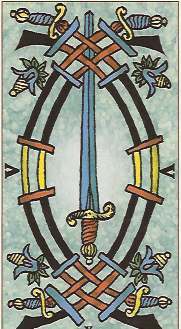 Lo Scarabeo recolored Burdel’s 1751 deck and renamed it the Universal TdM. The four suits are color-coded. 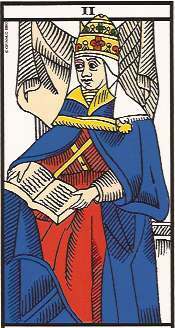 The Golden Tarot of the Renaissance published by Lo Scarabeo is a faithful reproduction with gold foil of the 1470 “Estensi” deck from Ferrara. Six trump cards are modern replacements. 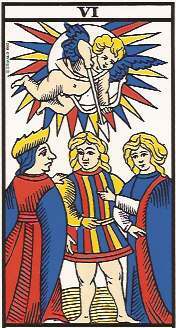 The minor arcana is illustrated with scenes taken from a fresco that dates to the same time as the deck. NOTE: Visit the Resources page for websites where you can see more cards and for a list of deck vendors. If you’re ready to start using your cards, start with Read the Pip Cards.